Ok, parents, can we have a huddle? Because I am not really understanding why, when we sign our children up for sports, we insist on bringing cookies and chemical-laden “sports drinks” for post-game snack. I know these snacks are cheap and quick, but why, when we spend about a kazillion dollars on sports equipment to keep them safe on the outside, do we collectively cheap out when it comes to what goes inside our little athletes? Did you know that what an athlete eats and drinks in the first 45 minutes after exercise is the most significant nutrition they receive all day? Let’s have a new game plan. Let’s agree that we are not going to offer snacks that have ingredients you cannot pronounce or have never seen growing in real life. I promise to never feed your child something that has chemical additives, preservatives or high fructose corn syrup after a game and you do the same. Deal? Deal! Now, play ball! 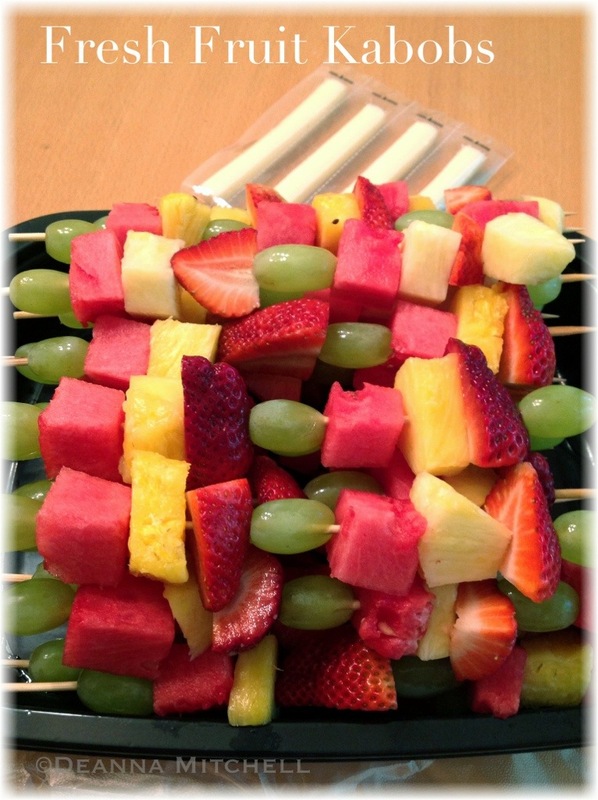 I made these fruit kabobs for Ellie’s softball team and they were fun and yummy. Along with water and string cheese, they made for a quick, but healthy snack. Total time to put them together was 15 minutes, so they didn’t take all day and the total cost was $2.00 per girl, which I can manage since I only have to bring snacks twice the entire season. Those girls are worth it!